The Emergency Department (ED) is often the point of entry for seniors into the healthcare system and plays a unique role in setting the trajectory of care for this rapidly growing and often vulnerable segment of the population. ED visits by older adults increased 24.5% from 2001 to 2009, and annually there is nearly 1 ED visit for every 2 older Americans. To that end, the ED is increasingly leveraged as the “front porch” bridging the community to health systems, and outpatient to inpatient care. This growing demand for senior-specific care in the ED has been recognized as a top priority by national geriatric and emergency medicine organizations starting with the endorsement of the 2014 Geriatric ED guidelines that outline recommendations for optimal geriatric emergency care. In fact, when the concept of the “Geriatric ED” was first proposed in 2007, no GEDs existed, a decade later, estimates indicate well over 100 such EDs exist. Additionally, there are other indicators that Geriatric Emergency Departments (GEDs) are rapidly growing. For example, in late 2017, the American College of Emergency Physicians (ACEP) announced it would be launching an accreditation program to formally recognize ED’s providing enhanced emergency care for older adults throughout the nation. Finally, the John A. Hartford Foundation (JAHF) recently initiated the Age-Friendly Health Systems initiative, organized around the four essentials — or 4Ms — of what Matters to the patient, Mentation, Mobility, and Medication. GEDs are synergistic with the Age-Friendly Health Systems initiative in that its goal is to enable emergency care redesign in an age-friendly manner incorporating all 4Ms. In partnership with JAHF, current efforts are focused on education and training of an interdisciplinary GED workforce, expanding the evidence base on the impact of GEDs, and capacity building to help spread and sustain GEDs throughout the nation. 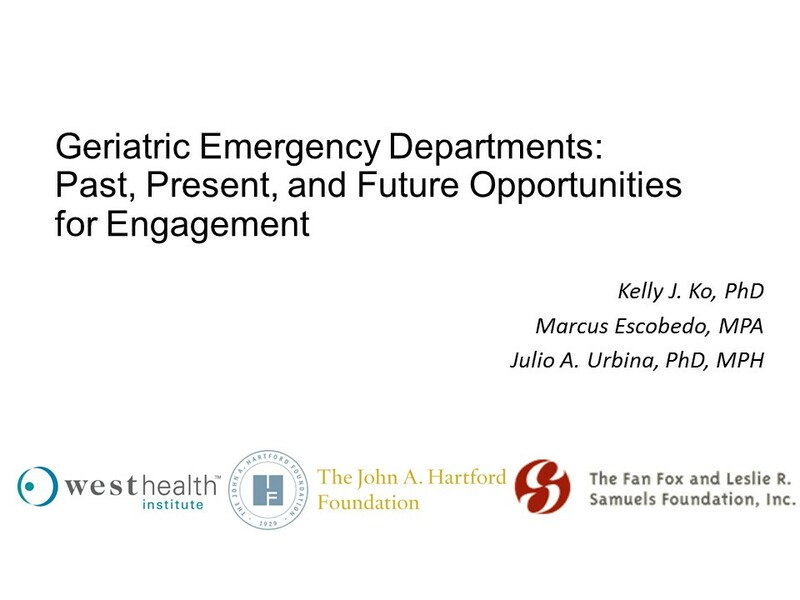 During this webinar, we will provide an overview of different ways in which organizations can get involved in helping grow the field of geriatric emergency medicine, specifically in areas related to education and training, research, and capacity building. Julio Urbina, PhD, MPH, Vice President & Director, Healthy Aging, the Fan Fox & Leslie R Samuels Foundation, Inc.
GIA members will gain a better understanding about the unique needs of seniors in the ED, the current state of GEDs throughout the nation and opportunities to get involved in helping spread GEDs nationally.